A radio-collared Yellowstone Bison Cow equipped with a vaginal radio transmitter, similar to the cow in this photo, was shot and killed by Montana Livestock Agents two days ago, when it swam the Yellowstone river and wandered into an area that livestock interests don't want to see Bison. Twenty five Radio-collared Bison were hazed out of Yellowstone earlier this month in a multi-million dollar experiment to see if some Bison could be allowed to migrate out of Yellowstone in the winter to traditional winter ranges. All of the cows were fitted with vaginal radio transmitters so that researchers could monitor any births taking place this spring. Montana Livestock Agents and Yellowstone Park Biologists are having a meeting to try to decide what to do with the remaining twenty four bison. Killing them all is one of the options. Sounds like a mad scientist experiment gone wrong? It is. Yellowstone National Park has been turned into a intrusive zoo where the animals are fitted with radio-collars in never ending studies similar to this sad case. A recently ended cougar study used dogs to chase, tree and radio-collar every adult Cougar and most of the kittens in the northern range of Yellowstone. Every other Wolf in Yellowstone has been chased down by biologists in helicopters and collared. Grizzly bears are routinely snared with injury causing leg hold cable snares. Coyotes are routinely caught in steel traps for collaring. River otters have radio transmitters placed in their body cavities. The only Wolverines in Yellowstone are radio-collared. The only Lynx are radio-collared. The Elk are collared. This same abuse disguised as research is common in ALL of our National Parks! UPDATE!! 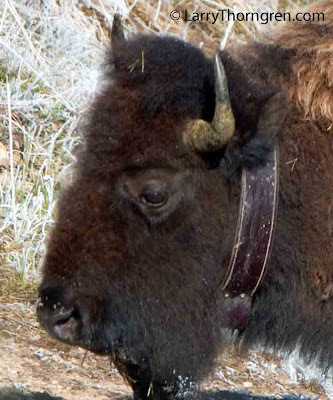 2/1/11 Thirteen of the original twenty five Bison were captured and transported back into Yellowstone last week. This $3.3 million boondoggle gets more depressing with every passing day. Thirteen more of the experimental Bison have crossed the Yellowstone River and are in danger of being killed.